Preliminary data for a White Divide Tour! I've assembled two possiblities out of the dozen or more available in the North Fork Kings basin. Both of these assume that the Hell-For-Sure area is expendable, a topic entirely unto itself! I'd like to see that area, but if something must be given up the HFS area can be added to a future trip much more easily than Crown Basin. 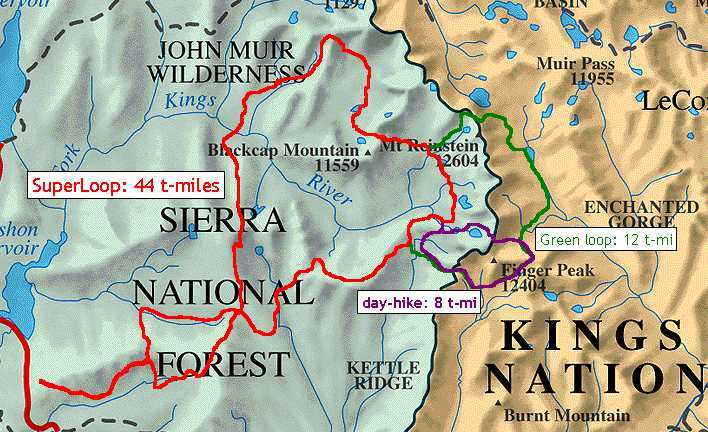 Therefore, these trips approach from the more southerly Rancheria trailhead. 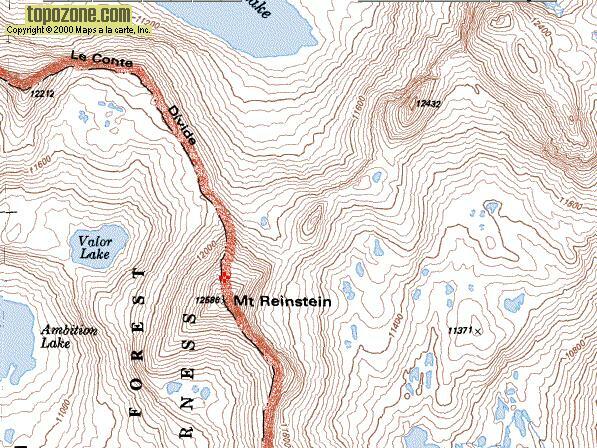 The first route was tinted red in the Topo! program and thereby named itself. 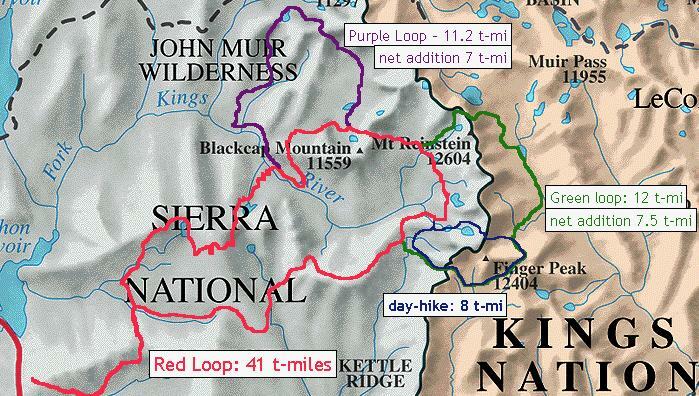 It visits Crown and Blackcap Basins and the lower portion of Bench Canyon before curving back toward the trailhead. It sees some fantastic country, but has a few weak spots to the north and east. 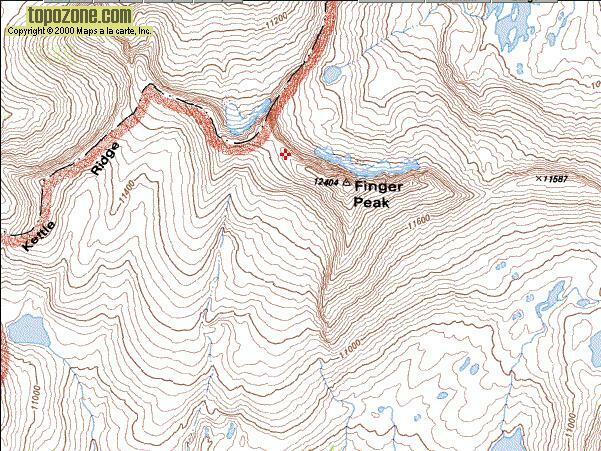 A day-hike can cover the east side near Finger Peak, but the north option added quite a bit to the trip. The later SuperLoop option addresses most of that, stopping just short of the Devil's Punchbowl and descending the east fork of Meadow Brook. This crosses only one of the plainly-named 'Two Passes', which I therefore call One Pass. The summit of Mt. Hutton is a short and easy walk from the pass, bringing the spectacle of Red Mountain Basin into view. The final days are lonelier and more direct, using Nichols Canyon to Crown Pass followed by a near-timberline traverse across Chuck Pass and Castle Peak before descending for good to the trailhad. 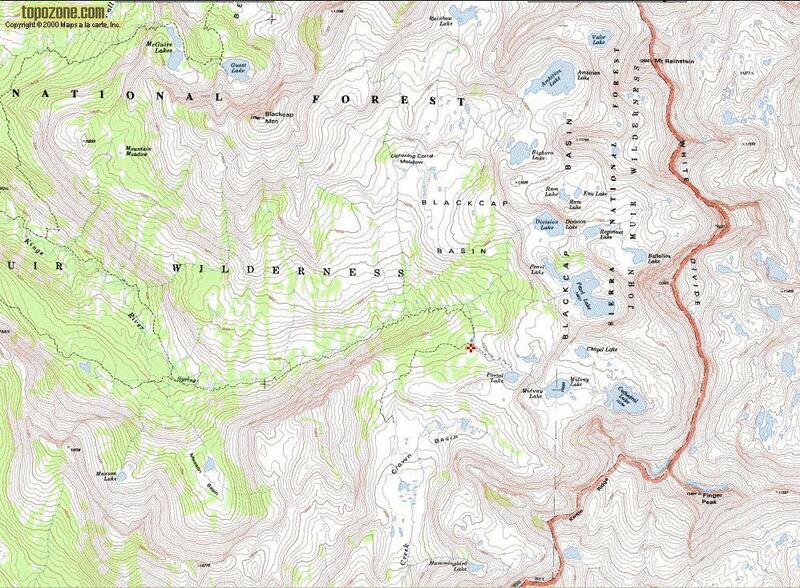 Note that that topo miles, or t-miles, chronically understate mileage on the ground. Elevation profiles show nearly equal mileage scales. Four maps, courtesy of TopoZone.com!